Mikaela Shiffrin gives an 'oh well' look after realizing she had won the slalom Saturday at Squaw Valley. OLYMPIC VALLEY, Calif. — Hundreds of athletes, celebrities and others patiently wait for the Funitel to open for first tracks at Squaw Valley’s Dawn Patrol on Saturday as part of the resort’s World Cup racing weekend. Local athlete Travis Ganong stands with the crowd, meeting fans and casually conversing with fellow skiers. He has come to get a few turns in before getting on a 5 a.m. flight on March 12 heading to Aspen for World Cup finals. “It’s exciting to have this event here for the first time in 40-plus years,” he says. “The women are such an inspiration to the younger generation of skiers. Unlike World Cups in other locations where the event is spread out, everything is concentrated in one spot here; it makes it easy to get around. As a Squaw Valley native, Ganong is an alpine ski racer who specializes in the downhill and super-G. Although Ganong is originally from Lake Tahoe, he has spent the last five months in Europe and Asia on the World Cup circuit. “There’s so much snow (in Lake Tahoe), it’s definitely nice to be back and see a full lake,” he says. Packing in the people on the Funitel, South Lake Tahoe business owner Bud Hillman and his son Danner plan on getting a few turns in before the day’s World Cup slalom races and festivities. “(On Friday), the event went so well, and Mikaela Shiffrin did awesome. It was also nice to see our girl (U.S. Ski Team member) Megan (McJames) do so well when she’s basically been on her own and has had less support than what Mikaela gets,” says Bud. As a season pass holder to Squaw Valley and Kirkwood, Bud has gotten 60-70 ski days in this year, but say’s it’s been challenging due to the changing road and weather conditions. Danner agrees and adds that he hasn’t gotten to ski as much as he has wanted, but that he welcomes all the fresh snow. “This is the most snow I’ve ever seen at Squaw,” Danner adds. Danner competes on the Diamond Peak Ski Team (where Incline Village native Lila Lapanja’s father is a coach) and says that the World Cup is awesome to watch. “(Diamond Peak) has put together a good team with a lot of local talent,” says Bud. Coming off the Funitel and going directly to the Gold Coast chairlift, West Shore local Kurt Williams is also enjoying the freshly groomed tracks during dawn patrol and has embraced all of the snow Tahoe has received this season. “I’m lucky. I live in a place without much snow removal — all I have to do is dig out my own parking spot,” says Williams. After receiving a complimentary day pass to ride Squaw, Williams figured he would get a few turns in while the crowds flock to the World Cup event. Venturing over to the backside Shirley Lake area, Bay Area resident Katie Wilcox says she skis at Squaw a fair amount but came up specifically this past weekend for the World Cup. Wilcox agrees that although Lake Tahoe has received an epic load of snow, she has gotten less ski days in due to the weather. Meandering over to the Granite Chief lift, young Bobbi Jo Griffin is a local ski racer in the Far West U-12 ladies division who is skiing Squaw with her friends. Griffin says she likes skiing Squaw but makes it over to Sugar Bowl more often because it’s closer to her house in Sierraville. “It’s my daughter’s birthday and we own a home in Squaw, so grandpa brought all of the kids out,” says Griffin’s family friend, Bill Macartney. Although everyone headed back over to the other side of Squaw to catch the opening of Headwall and Siberia terrain, I take one more run on Granite Chief because it is empty. I ride the chairlift with Laurel Nichinson, a Bay Area resident who also owns a home in Squaw Valley. She usually rents her place out when not occupied, but blocked it out for herself for the week to enjoy the World Cup. There was no way she was going to miss it. “It’s very different watching this event live than seeing it on TV. I’m a novice and this is my first live ski event of this class. What really moved me was the emotion you experience with each athlete regardless of the team they represent,” says Nichinson. “Like watching Shiffrin’s last ski run down on Friday or (Goggia) complete her second run after losing her pole, it could have been a sister or best friend, even though I’ve never met either athlete. Laurel says she was so into the event that she didn’t even go into the tent for the free food she gets as a VIP. “I hope the athletes will experience the mountain and great snow conditions here and want to come back for another event,” she adds. Making my way back over to the front side via Shirley Lake Express again, Vermont resident Jessica Bentz says she flew out to Lake Tahoe specifically to watch the World Cup. Bentz definitely got the best of both worlds for the World Cup as she arrived on Monday, March 6, during the last storm — basking in fresh powder and groomers throughout the week. “The World Cup is fantastic; it’s a fun circus,” she says. Max Rainoldi is a Squaw Valley Development Ski Team Coach escorting a group of 10-14 year olds down the mountain. This particular program is a feeder team for kids who are then ready to start racing or maybe veer toward freestyle skiing. “I grew up on the program here so I feel like I’m paying it forward,” says Rainoldi, adding that the girls on his Squaw team are excited about the World Cup being in town. “Some of them are all about Mikaela and the racing event going on. They don’t even want to ski today, they just want to get Mikaela’s autograph. It starts with the parents and how involved they are. 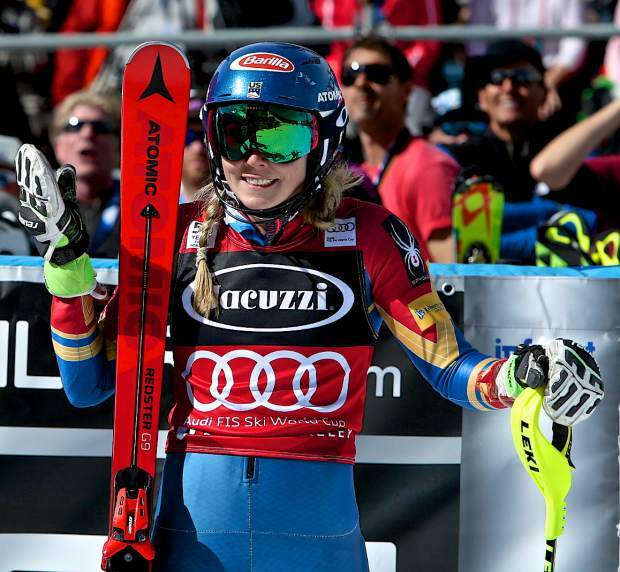 Later Saturday, at around 2 p.m., word got around that Shiffrin had clinched the World Cup title.